As a little girl, I was obsessed with kilts. The short silhouette, the plaid, and especially the oversized safety pin that held them together fascinated me -- and, as a result, I had no less than 5 in my closet before I turned 10. I guess you could say my fascination with safety pins has never really gone away ... and thank goodness, because there's been a resurgence of them as of late! Safety pins are popping up on T-shirts, shoes, jewelry, bags ... you name it, there's a safety pin covering it. (The Tom Binns Swarovski Crystal Safety Pin Earrings, $189 at net-a-porter.com, above may be some indication.) Check out some of my favorites after the jump. Antique bronze, silver and gold coins hang from a large safety pin that looks perfect on any black blazer. A studded safety pin hangs from a delicate silver chain. Seriously, Tom Binns, can you do no wrong? 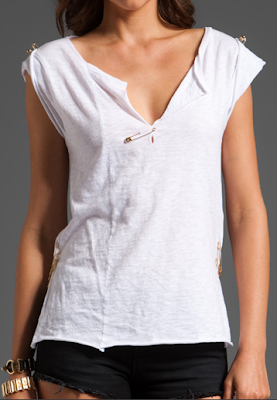 From the cutesy saying to the gold safety pin motif, this is one top I need in my closet. Nappa lambskin leather, a sleek silhouette, an oversized safety pin detail ... what more does a girl need? 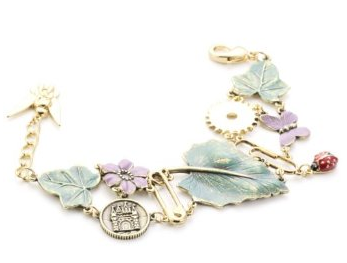 Delicate ladybugs and butterflies meet tough safety pins in this unique take on the trend. Rows of safety pins toughen up an otherwise demure silhouette. I'm totally waiting on pins and needles to get this tee. A safety pin necklace that actually doubles as a pin? Now that's ingenious. A slouchy silhouette, deep hem vents, a safety pin detail ... what's not to love?